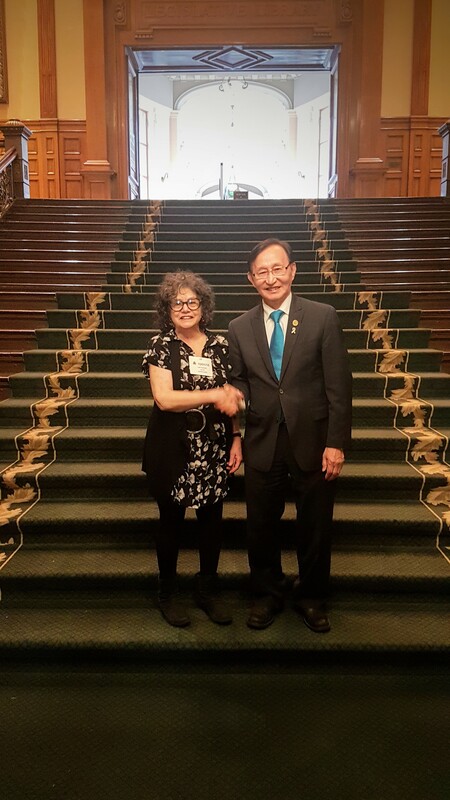 On October 1, 2018 – the International Day of Older Persons – the Honourable Raymond Sung Joon Cho, Minister for Seniors and Accessibility, invited representatives of seniors’ organizations to the Legislative Assembly. Joining Care Watch were representatives from AdvantAge Ontario, Advocacy Centre for the Elderly, Alzheimer Society of Toronto, La Fédération des aînés et des retraités francophones de l’Ontario (FARFO), Older Adult Centres’ Association of Ontario, Ontario Association of Councils on Aging, Ontario Interdisciplinary Council for Aging and Health, Ontario Public Service Quarter Century Club, Ontario Retirement Communities Association, and Ontario Society of Senior Citizens’ Organizations. Minister Cho thanked these organizations for making Ontario safer, more age-friendly, and more respectful for older persons. He commented that treating seniors with the respect they have earned will be at the heart of everything this government does. He considers building respect for seniors as one of his top priorities and keeping seniors safe, connected, active, and engaged as a central goal. This year, the United Nations is celebration focuses on seniors who champion human rights, and Minister Cho spoke of his own experience advocating for human rights in North Korea. He also acknowledged his gratitude to the Canadians who served in the Korean War, observing that those remaining are now seniors. He concluded with a call for the members of the Legislature to work harder for an Ontario where older persons are proud, respected, live with dignity, and can contribute to society – not only today, but every day. Afterwards, Minister Cho posed for individual photographs with each of the representatives attending the session and with the group of representatives.